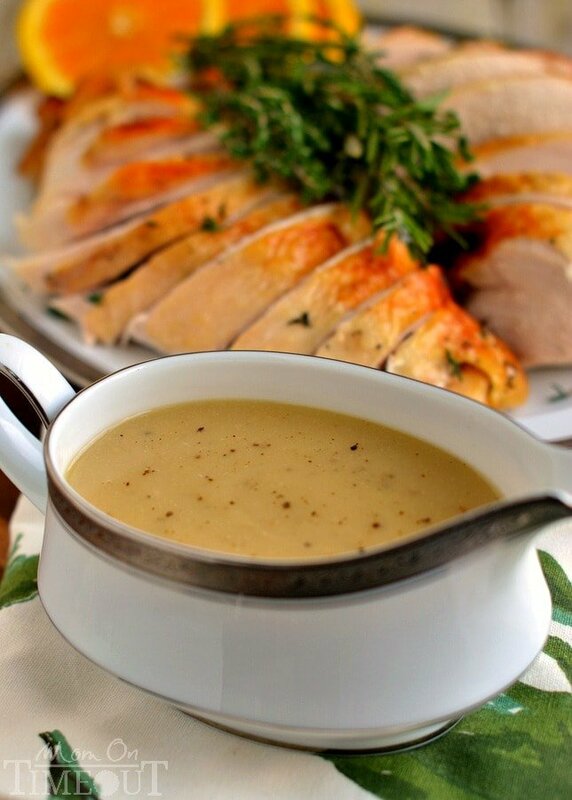 Silky smooth and perfectly rich, this really is the BEST Turkey Gravy recipe around! There’s nothing better than topping creamy mashed potatoes with the most amazing turkey gravy and this recipe delivers – every single time. 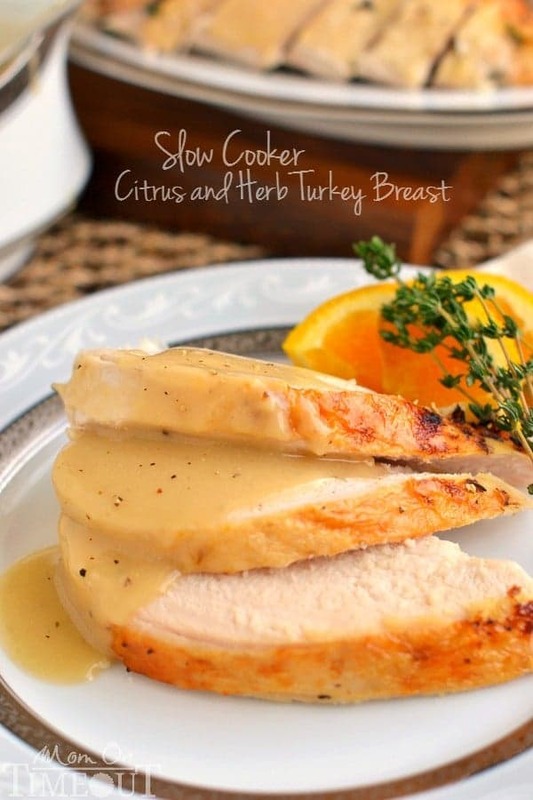 Complete your holiday feast with this incredible Slow Cooker Turkey Breast with Citrus and Herbs, Best Ever Cranberry Sauce, Twice Baked Potato Casserole, and yummy Crescent Rolls! Big claim right? Well the good news is I can totally back it up 🙂 This is a classic turkey gravy recipe with a little twist…but we’ll get to that in a minute. So last week I shared my slow cooker turkey breast recipe and y’all would have to be crazy if you didn’t think I was going to make some mashed potatoes and gravy to go with it. In doing so I realized that I needed to share this gravy recipe with you all and along with it, my tricks for achieving that perfect turkey gravy. It all starts with the drippings. Whether you roasted your turkey or slow cooked it, there will be drippings. Drippings refers to the juices or liquids left in the pan – this stuff is like liquid gold people. Treasure it. Love it. Turn it into gravy. 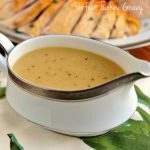 What Do I Need To Make Turkey Gravy? Fat. This is what combines with the flour and creates the roux. For the best gravy make sure to gather as much of the turkey drippings as possible and place in a container. You an use a gravy fat separator, a bowl, or a glass measuring cup. Let it the fat separate and use this to make your gravy. Any additional fat needed can be made up with butter. Flour. This is what thickens the gravy. When mixed in with the fat (see above), it creates a roux which is the base of the turkey gravy. Liquid. The liquid is what determines the overall consistency of the gravy; whether it’s thick or thin. This is often the part of each gravy recipe that you need to “eyeball”. You can always add more but you can’t take it away so go easy here. I like to use the turkey dripping so I get the best flavor. If I run out, I supplement with turkey stock. Butter or Cream. This is kind of my secret ingredient for the creamiest gravy imaginable. 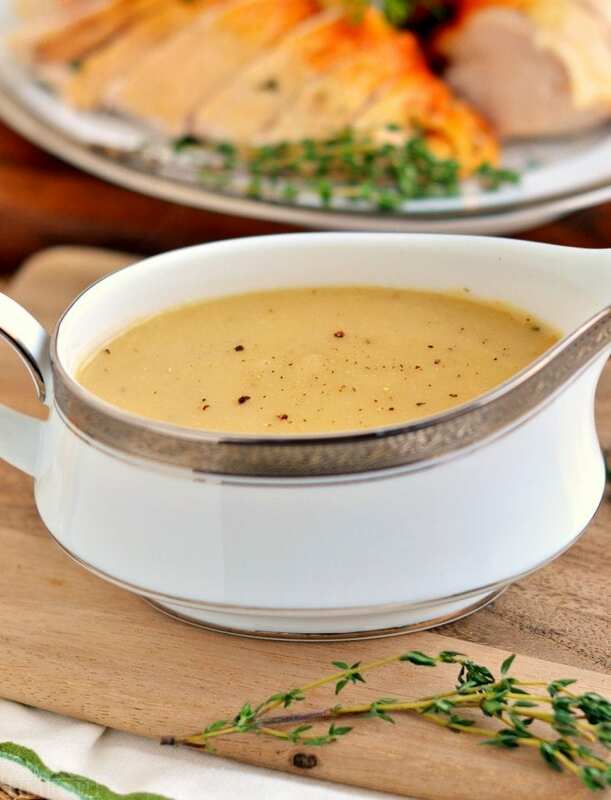 It doesn’t take a lot of butter or cream to get rich, creamy gravy that will have your guests asking what did you do?? Salt and Pepper. This is possibly the most important component of good gravy – the seasoning. I love a lot of fresh ground black pepper in my gravy. But this is really where your own tastes come into play. Grab a spoon and get to tasting! Do not add salt and pepper before you’ve tasted the gravy. It may already be plenty salty, you won’t know until you try! First remove the turkey from the pan. Pour all the drippings into a container (I use my 4 cup glass Pyrex measuring cup) and let the fat rise to the top. You will see a layer form at the top that appears solid – that’s what you’re going to use to make the roux. Skim off the fat and, if you’re not used to eye-balling measurements, make sure to measure it. This recipe is based off of 1/4 cup of fat but I usually double or triple it depending on how much drippings I have. If you require more fat, supplement with butter. Transfer the fat to a large saucepan over medium heat. Let the fat melt and then sprinkle on the flour. Using a wooden spoon, stir continuously until the fat and flour have formed a homogeneous mixture. Continue stirring until the flour browns slightly, this takes 4-5 minutes. Whisk in the hot drippings slowly into the roux. Keep whisking until the liquids are fully incorporated. Now bring the gravy to a simmer and continue simmering until it reaches your desired consistency. Season with salt and pepper and for the final step…stir in one tablespoon of butter. Over the top to be sure but it adds a silkiness and richness to the gravy that is phenomenal! And that’s it! Remember these quick fixes if you find yourself in a jam: too thick – add broth, too thin – mix one tablespoon butter with one tablespoon flour and whisk in, lumps – use your strainer. Enjoy! 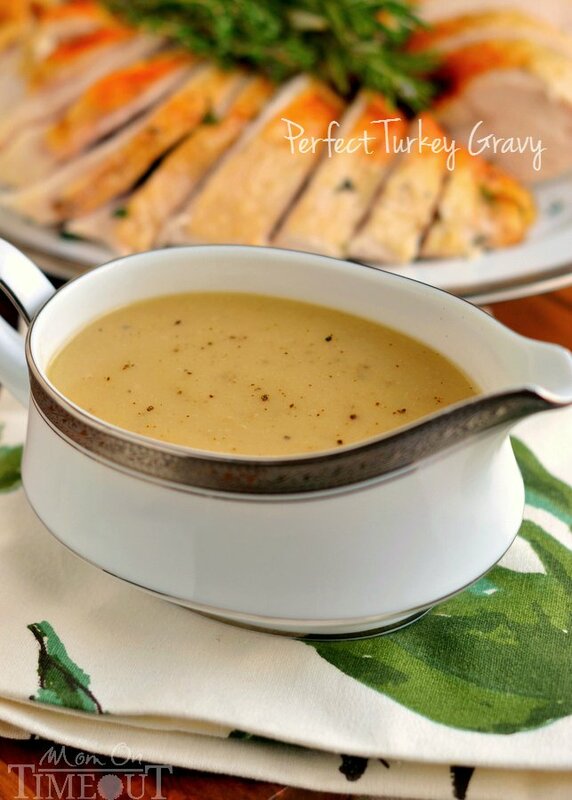 Silky smooth and perfectly rich, this really is the BEST Turkey Gravy recipe around! Too thick - add broth. Too thin - mix 1 tablespoon of butter with 1 tablespoon of flour and whisk in. Lumps - use your strainer. Fat from drippings can be supplemented with butter if you need more. 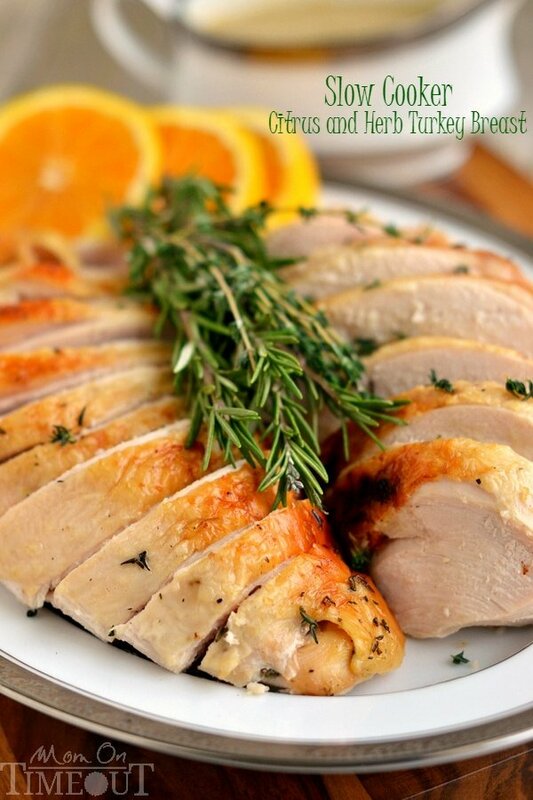 Drippings can be supplemented with turkey or chicken broth if you need more. I’m pretty sure this gravy is the best I’ve seen in a long time. This homemade gravy looks incredible, Trish! Love your tips! I am a sucker for gravy and would be tempted to pour this on everything! Pinning! Pour away! We do 🙂 Thanks for the pin Kelly! Wow. This gravy looks amazing! I’ll take your word as it being the best because it certainly looks amazing. Wishing I could pull it through into my kitchen right now. Hubby smothers everything in gravy so he’d certainly appreciate this one! LOL! Sounds like my ENTER family Melanie 🙂 Thank you!! Mmmm – you made me sad that I have to wait until NEXT week to have turkey with gravy. Love your description of the drippings – liquid gold! Couldn’t have said it any better. Hehe! That they are Sarah 🙂 Hope you have a wonderful Thanksgiving! Homemade turkey gravy is a must at our Thanksgiving! I’m going to have to keep your tips in mind while I’m making it this year! I love your no-lumps tip! My mom’s gravy has always been, well, lumpy. I think I’ll take over from her this year and try to make your version! Haha! Well don’t tell her that Mir 🙂 Thank you! I always used to use gravy mixes, but once you try homemade there’s no going back. Yours looks incredible! Agreed Krystle! Homemade is for sure the best way to go. Thank you! The gravy used to scare me more than drying out my turkey years ago — so much so that I would always ask someone else to do it! Your instructions are so clear and concise, and I wish I had seen this years ago! Pinned. Gravy is kind of like pie crust–we’re all a little intimidated by it! Thanks for making it a little easier!